DOETINCHEM, the Netherlands – 2018 has been a milestone year for e-bike innovations. An unprecedented number of new suppliers of motor systems have arrived. The newcomers as well as already existing e-bike transmission specialists present more powerful, more compact and above all more lightweight mid-motors. 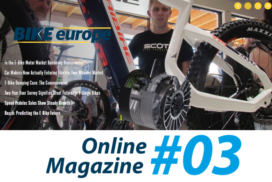 An overview of all developments as well as innovations is in Bike Europe’s 3rd online magazine. Is the e-bike market becoming overcrowded? Click here for Bike Europe’s online magazine, edition 3. Interested to get the latest news on the e-bike innovations?